OAKLAND, Calif. (AP) Billy Beane will watch Oklahoma football this fall with great interest in the Sooners quarterback: Kyler Murray will be a member of the Oakland Athletics as soon as his college career is complete. A’s manager Bob Melvin, an admittedly superstitious guy, might close his eyes and cross his fingers the prized prospect stays healthy before switching sports. First-round pick Murray signed Friday, met his potential future teammates and took batting practice at the Oakland Coliseum in uniform – then it will be back to preparing for football. 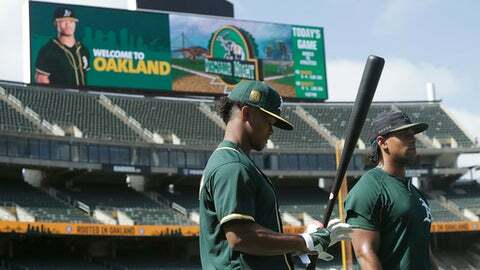 He was greeted by ”WELCOME TO OAKLAND” on the big scoreboard with his photo. When Oakland drafted Murray ninth overall last week, there was an agreement between the A’s, Murray and his super agent, Scott Boras, that Murray would play his final football season . Beane joked with Boras about Murray committing to 15 years with the A’s. ”Right now it’s getting ready to go win a national championship,” Murray said. ”We can’t wait `til January to have him here full-time,” said Beane, the A’s executive vice president of baseball operations. Murray was an outfielder for the Sooners this season and batted .296 with 10 home runs, 13 doubles and three triples in 189 at-bats. The A’s can’t wait to see how their prize prospect does with a full season of at-bats. Murray’s uncle, Calvin, was a first-round pick by the San Francisco Giants in 1992 and played parts of five major league seasons. The A’s believe it won’t be long until Murray is a baseball star – and for the long haul. ”This is arguably, and I can say this with a lot of pride, one of the most dynamic athletes we’ve selected since I’ve been here,” Beane said.